Home / Uncategorized / Pickle Promo! Iranians are famous for their pickles: it is, after all, the best way to preserve the finest bits and bobs each season has to offer. The most famous Persian pickle of all has to be khiar shor, or cucumbers. Not the sweet, fat dill pickles that we’re used to, or the even fatter chip shop wallies: no, these are smaller cues, perter, and they are preserved with chilli and tarragon and garlic. Totally addictive. They’re great sliced into sarnies, diced into salads, eaten whole alongside rice dishes, or enjoyed as a snack with a pint of something amber and chilled. Anyway, because we’re nice, and because they’re addictive, we’ve put them on a BUY ONE, GET ONE FREE basis (BOGOF isn’t funny any more, now is it?). Twice the crunchy, spicy goodness for the same price. The offer starts on Sunday 29th. It’s all very hush hush until then – it is only you lucky, lucky online readers who have got the heads up on this. BUT…there’s more. 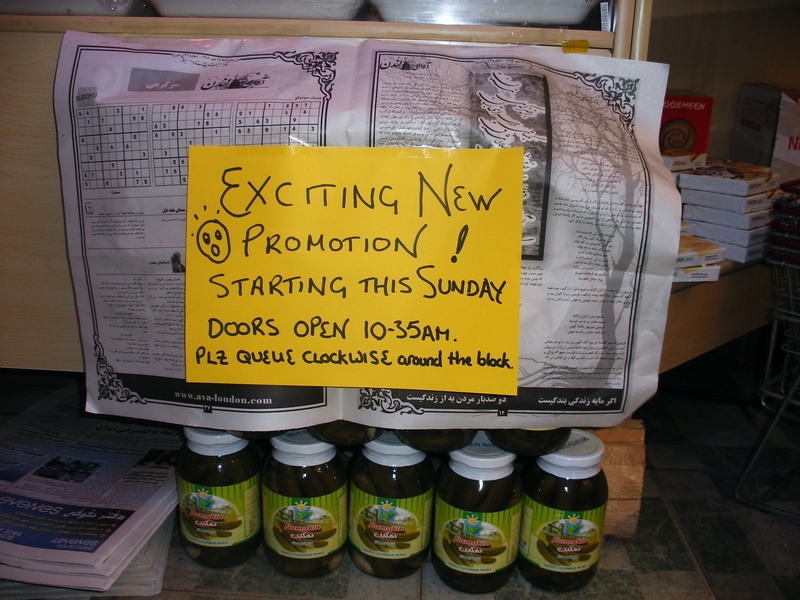 We are also running a special promotion on our torshi bandari (that’s dockers’ pickle to you). Bandari (from the Farsi word bandar or port) pickle is a spicy blended pickle, with a slightly chunky texture and a pleasant zing to it. 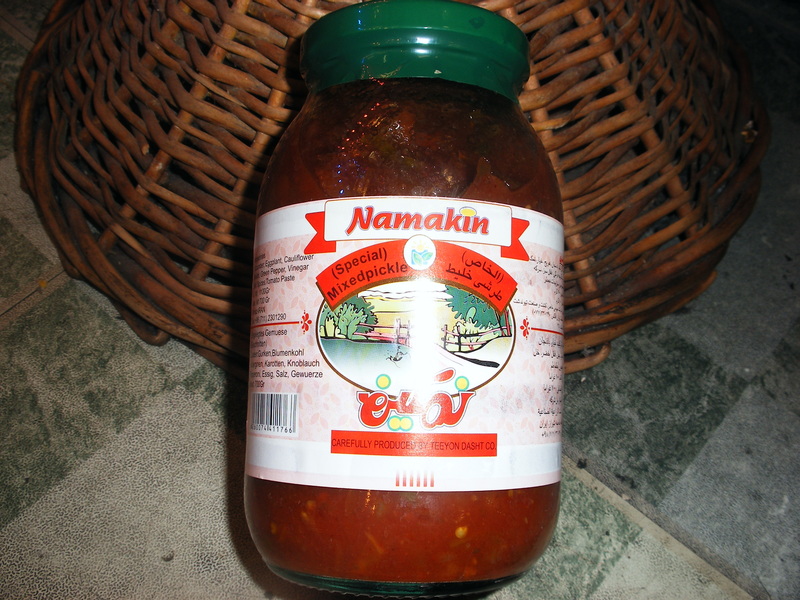 It is great as a relish to enjoy with cheese, alongside barbecued meats or smoky fish. But we actually use it all over the place. For starters it’s a corker spread over the base of a pizza. Unless you are a die hard ketchup fan, try it in a bacon butty. Or you can add it to some crispy fried onions and honey to get an awesome and instant sweet and sour sauce. Add a little to spicy fried sausages, and then scramble some eggs into the mixture: perfect Sunday brunch. Or why not use is as a marinade? It works brilliantly with salmon or tuna. Best of all: it’s reduced to just £1.00 a (fairly big) jar. Have we sold it to you yet?